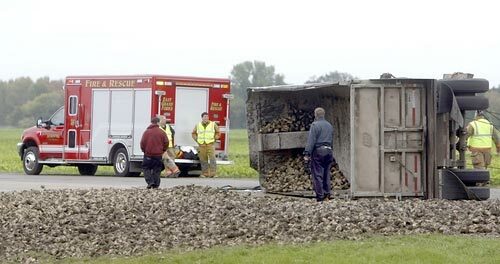 On April 28, 2009, a truck full of inedible chicken “slaughter material”, which includes heads and feathers, spilled some of it’s load on a Winona, WI street. The truck did not stop. 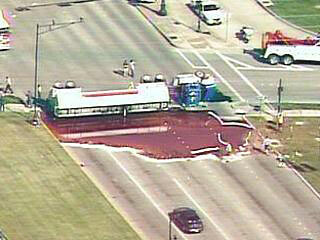 Apparently this was not the first such spill in the area. 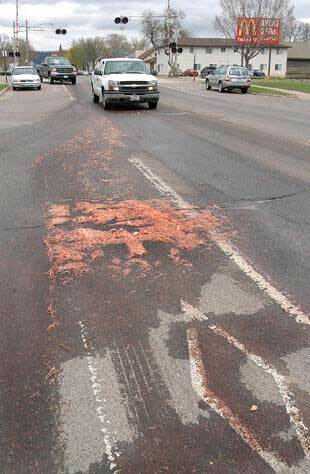 Three previous times chicken skimming were spilled and there were three car accidents because of the slippery road (explain that to your insurance company). Two drivers from a local comopany were ticketed in those incidents and witnesses say they were similar trucks, so police will follow up with the same company. 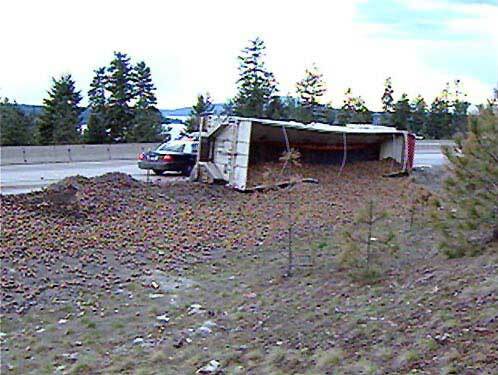 An Idaho potato truck spills 30 tons of potatoes on I-90 in Coeur D’Alene on April 3, 2007. 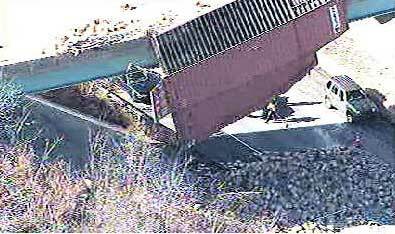 On Valentine’s Day, February 14, 2008, a container apparently fell off a tractor-trailer on I-95 on the ramp onto I-476. 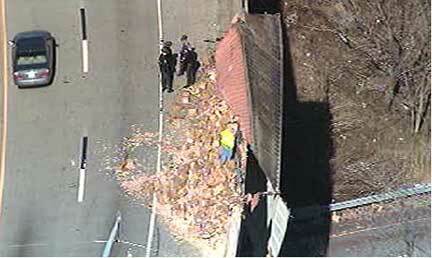 The container ripped open, spilling cookies on the ramp and onto I-476 below. Nobody was injured. 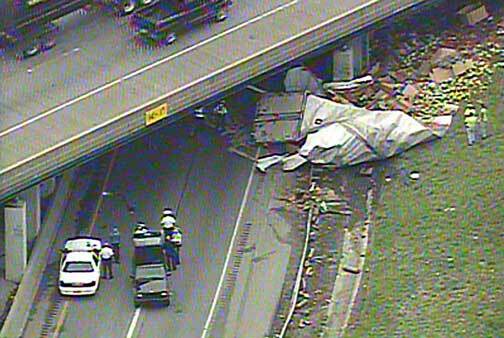 Workers had to lower the container over the side onto the highway below because it was dangling over the edge. 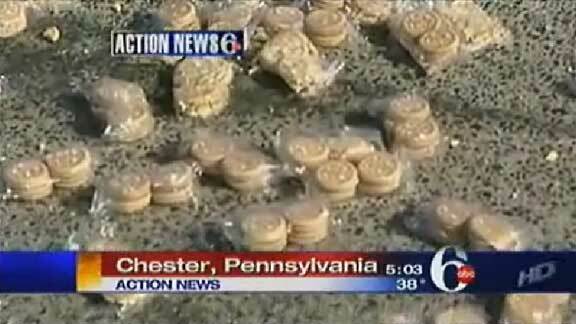 It took 5 hours to clean up the cookies, which were made in Honduras. 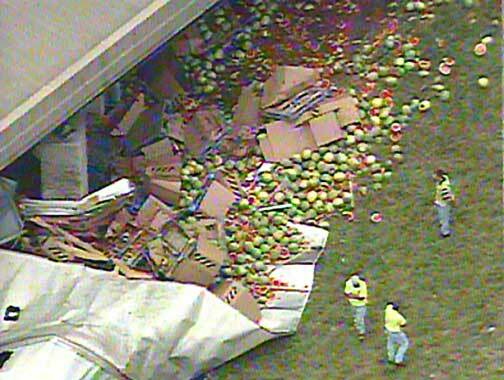 On Thursday, July 5, 2007, a truck crash spilled hundreds of watermelons across the interstate exchange in Cincinnatti. 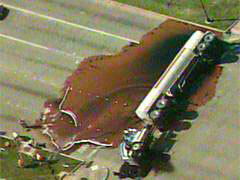 Unfortunately, the driver, who was not wearing a seatbelt, was killed when he lost control of the truck. The truck ran into a guardrail and overhead bridge support on the ramp from northbound Interstate 75 to westbound Interstate 74. 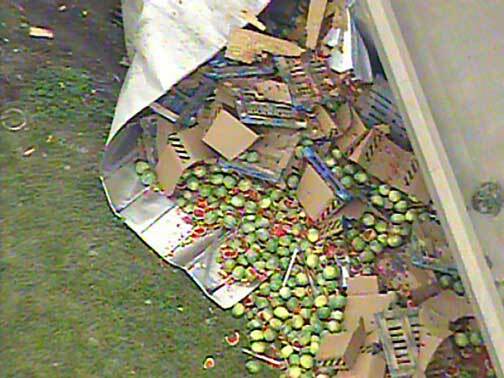 The truck rolled over and the trailer was torn open in the crash, throwing its load of fruit across the road and under the overpass. 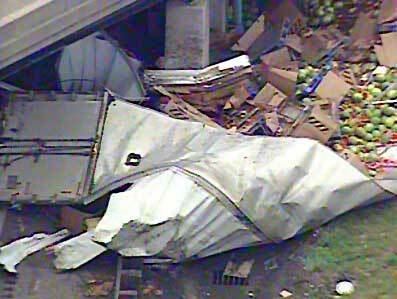 The ramp remained closed until about 7 p.m. while crews cleaned up the fruit. 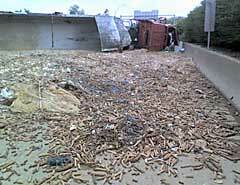 On September 26, 2007, a semi-truck overturned on I-471 South near Cincinatti at the Southgate, Ky. exit. 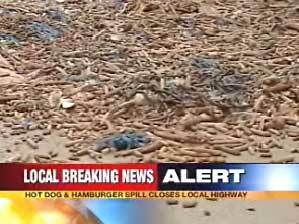 The truck spilled rotten wieners, sausages, and other processed meats on the highway. One report listed hot-dogs, lunch meat, and hamburger meat. 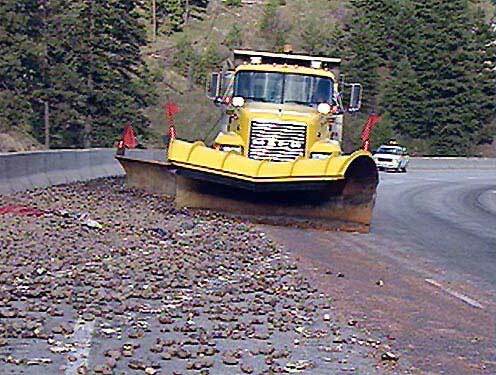 The road was closed for most of the day while crews cleaned up the disgusting mess. 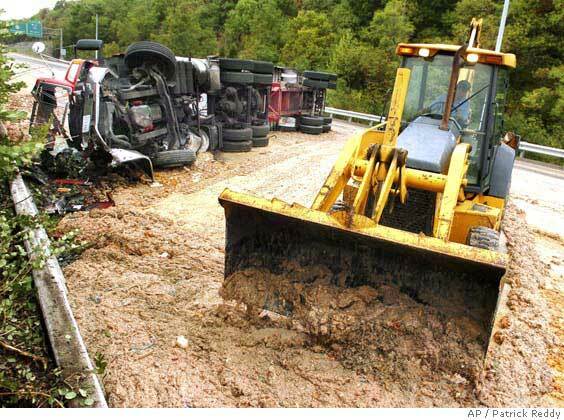 No one was hurt in the accident. 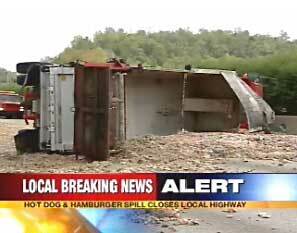 The truck was owned by Griffin Industries, which recycles animal and bakery by-product. (I’m curious what they recycle rotten hot-dogs into). 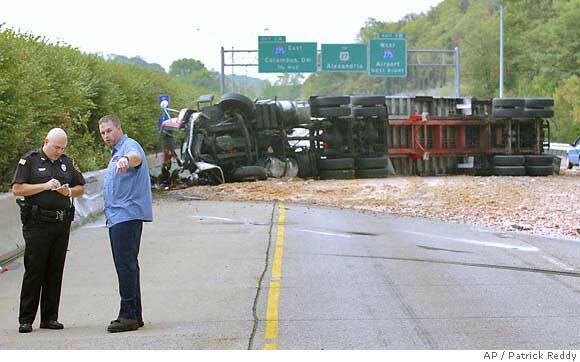 Reports were that the aroma from the accident will likely linger for some time. 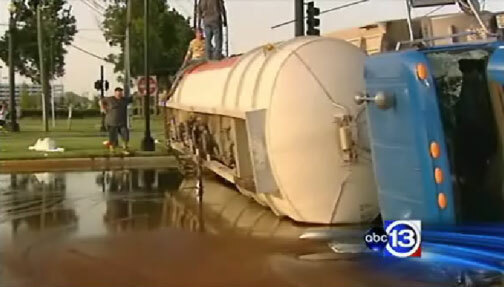 This spill is awesome, although it’s not technically a truck spill, but a ship spilling a container that probably would have eventually been on a truck (close enough). 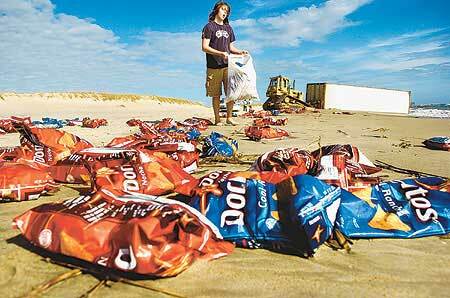 In November, 2006 a cargo container full of Doritos apparently fell off a ship. After drifting for several days, it was discovered by charter captains in the Outer Banks of North Carolina, who broke it open and helped themselves to the snacks (although I’m sure they didn’t know what was inside until they broke it open). Eventually, the container came ashore in Frisco, just south of the Cape Hatteras Fishing Pier, along with much of it’s cargo. 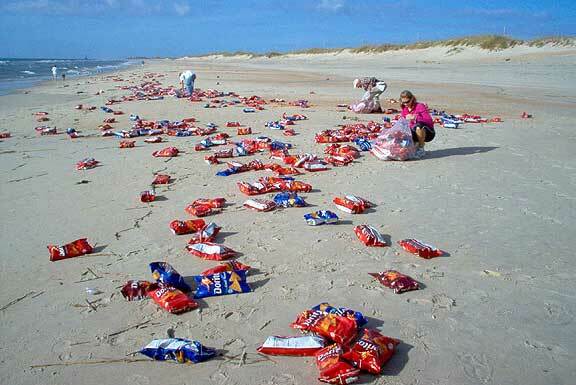 Thousands of bags of Doritos were washed up on the beach. 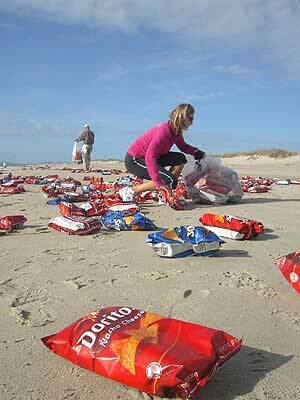 Residents stuffed garbage bags with the tasty treats, which were still fresh, since the bags are airtight. 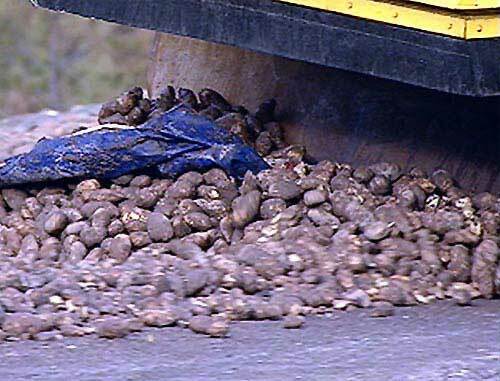 One person filled a truck with the chips. 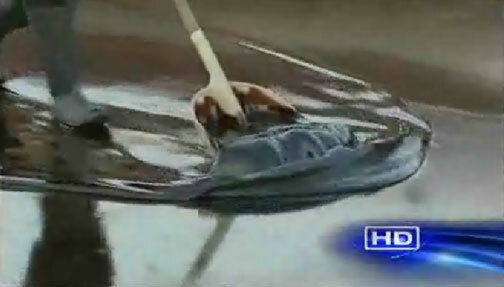 The Marine Safety Team in Elizabeth City was dispatched. They are responsible for cleaning up hazardous material, but when they found out it was Doritos, they determined it was not a contamination threat. 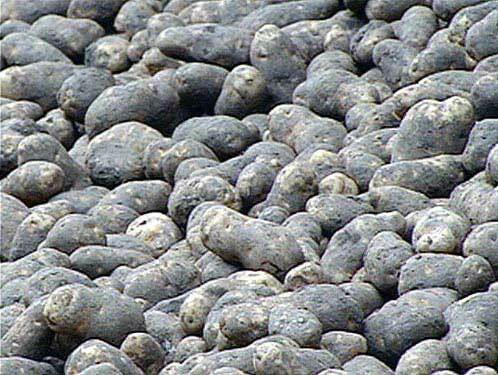 On September 17, 2007, drivers in West Michigan found themselves in a pickle (sorry). 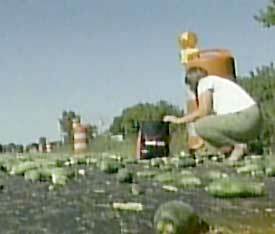 A truck travelling Northbound on US131 in Kalamazoo County lost it’s load of cucumbers, littering the highway for half a mile. 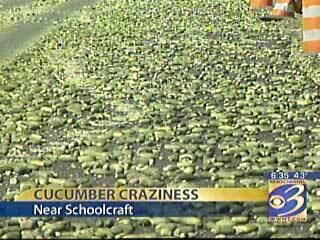 Drivers that were behind the truck stopped and picked up some of the cukes. 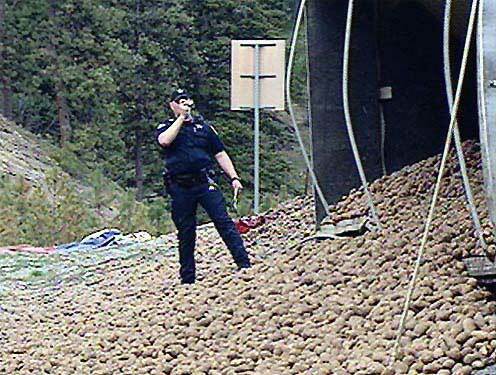 Officers were worried that the veggies would attract deer to the roadway, so they cautioned drivers to watch for them while passing the area. Nooooo! 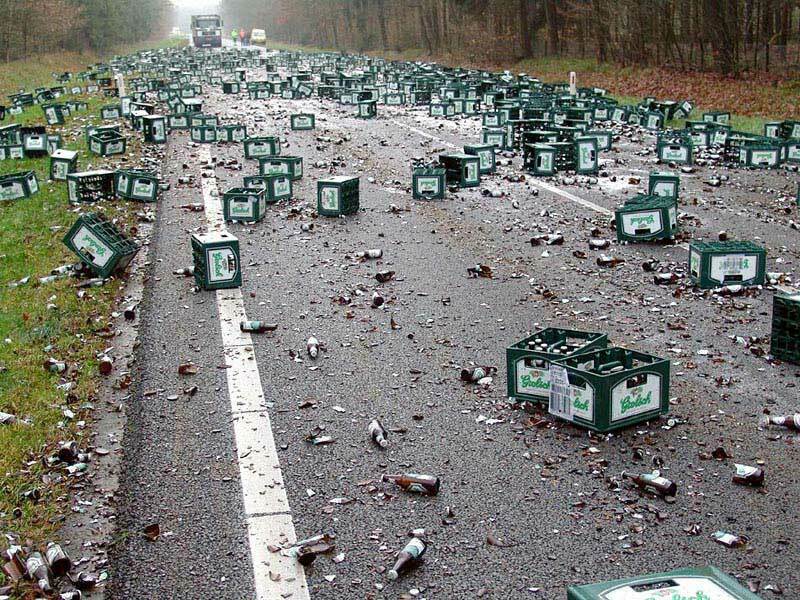 Highway 401 in Mississaugua (Canada, I believe) was closed on May 11, 2005 after an accident that spilled 2,184 cases of Grolsch beer. A woman driving a car, swerved out of her lane and into the path of a Molson beer truck, causing the truck to roll over and the car to flip. 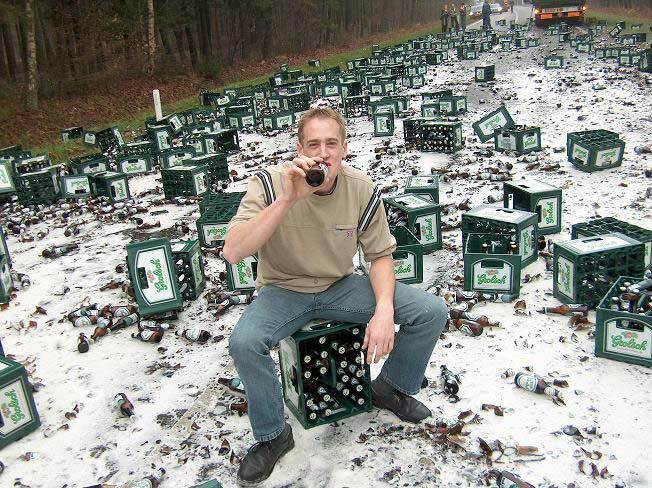 One officer described the scene as “a sea of beer”. 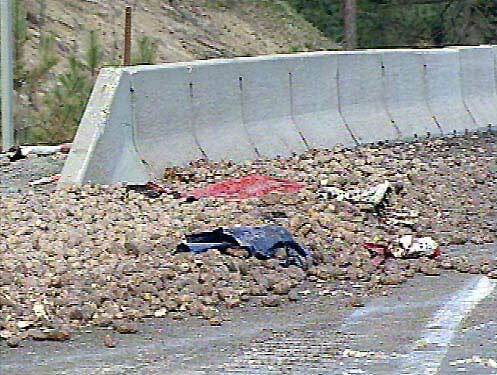 The woman’s life was most likely saved by her seatbelt and airbag. The beer was a gonner. See below for the Great Beer Spill Controversy! UPDATE 3/5/08: Wow! 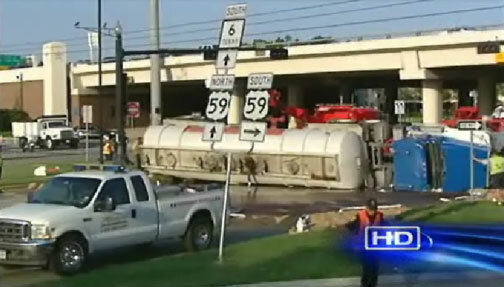 www.truckspills.com has gotten a lot of attention in the past few weeks. And apparently this story has upset a lot of Canadians who apparently do not appreciate being blamed for spilled beer. 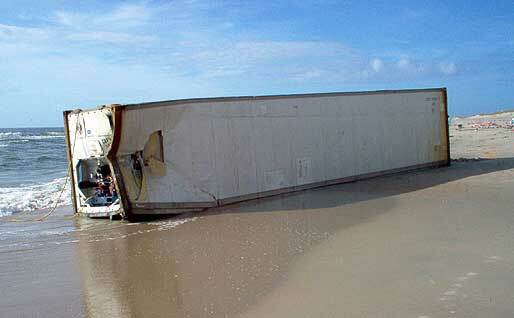 The original news story I got this photo from did say that it was “Highway 402 in Mississaugua”. The website was a Canadian newspaper. Another report said “heading north on the Trans Canada Highway to Thunder Bay”. “…that aint Canada, that’s in The Netherlands! So maybe you should update it or something, cause it sure is in Holland. Cool! I didn’t realize that I was living in Canada…. 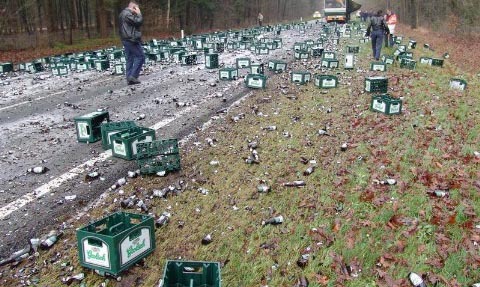 Two trucks crashed and one of them had beer on board! 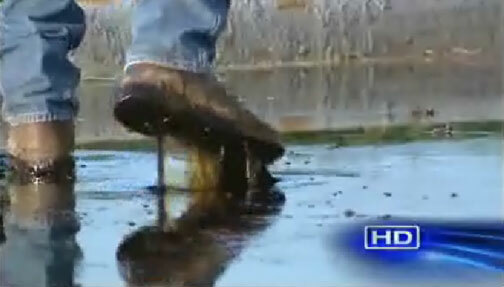 This one’s just about your Beer Spill article. As I’m writing this, you have “Highway 401 in Mississaugua (Canada, I believe) was closed on May 11, 2005” on the page. Just to correct it, it’s spelled “Mississauga” and it is indeed in Canada. Right next to Toronto, if that helps. As a Canadian an proud beer drinker, I checked out the page on the spilt beer to mourn this tragic loss…. While you say it takes place in Canada (first Mississauga and then the Trans Canada), I can 100% confirm that this is not a Canadian event. The vehicles (trucks and cars) in the pictures are not models sold in North America. Also, the road marking standard here is a yellow centerline with white lane markers (edges). The consensus so far is that it was in the Netherlands. If anyone can find an actual news report on this, I’ll gladly post it here to clear up the controversy. This site also claims it was Canada, but they could have swiped it from me. Will this ever be cleared up? We strive for accuracy! On the bright side, my further research has turned up the new photo posted above. Does anyone know this beer drinker? He has the answer! 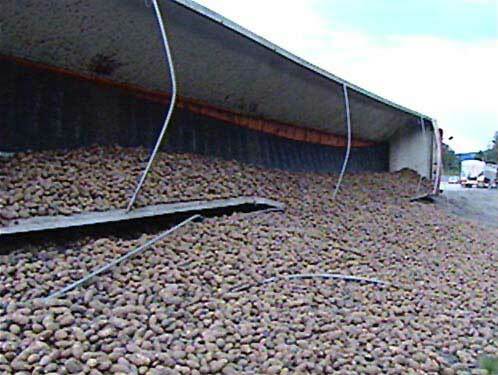 A Truck full of sugar beets overturned near East Grand Forks on October 2, 2008. The driver and his passenger were OK, but the driver suffered a cut on his head. Apparently the truck turned the corner too fast and lost control. A semi hauling sugar beets rolled over south of East Grand Forks this morning, spilling its load onto the road, shoulder, ditch and beyond. The crash, which was reported around 9 a.m., left the rig lying on its side in the middle of Highway 220, causing authorities to block off a stretch of the road. The driver and a passenger, both men, were in the cab when it rolled. 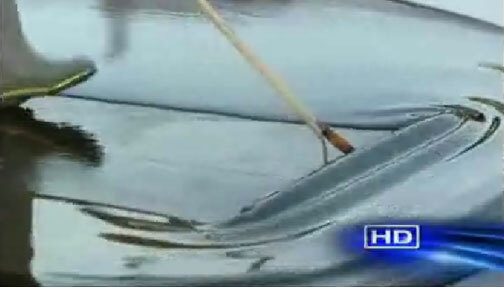 The driver suffered a cut to his head. 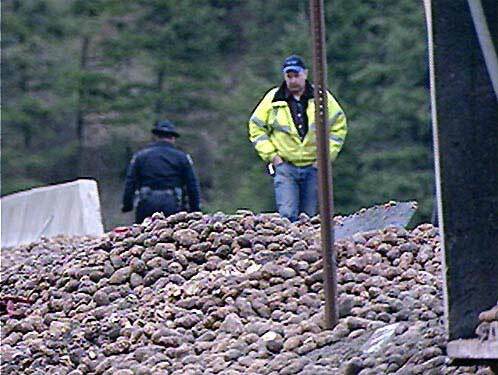 “He’s doing fine,” said State Patrol Sgt. Dean Smith. Smith did not know the passenger’s condition and he declined to name the two men. “It came into a corner a little too fast,” he said. Smith said a witness told authorities the northbound truck was traveling “fast” as it came into a turn where Highway 200 veers east at an intersection with Polk County Road 238. 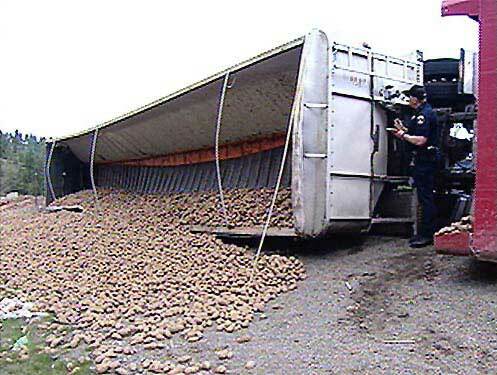 Apparently October 2 is the first day of the beet harvest and this was the first overturned truck of the season. 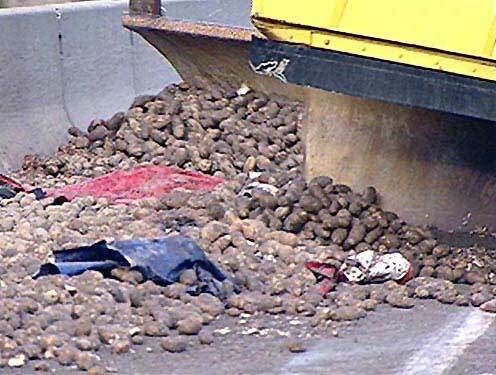 Unfortunately it wasn’t the last and there were a few fatalities during this year’s beet harvest. 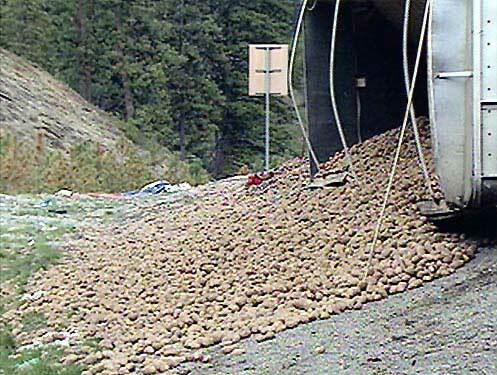 I must say I didn’t know the beet harvest was so dangerous.